"Tasty cookies made with walnuts and fondant. 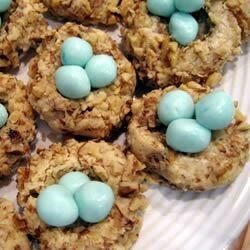 The title suggests what cookies will look like when finished, little nests with eggs in them...cute! Got the recipe from my aunt, don't know where it originated before that!" In a large bowl, cream together the butter and brown sugar until light and fluffy. Beat in the egg yolks then stir in the vanilla. Stir in the flour and mix well. In a shallow dish, such as a pie pan, beat egg whites until foamy. Spread walnuts on a plate or waxed paper. Roll 1 teaspoon of dough into a ball; roll in egg whites then in walnuts. Place 2 inches apart on a cookie sheet. Make a depression in each ball with your thumb. Meanwhile, cream the remaining 2 tablespoons butter with corn syrup, blue and green food coloring and almond extract. Gradually stir in confectioners' sugar. Roll 1/2 teaspoon of fondant mixture into egg-shaped balls. Place fondant eggs into hollows of baked cookies. Amazing little “nests” made with chow mein noodles and melted marshmallows. These cookies are amazing!!! I loved them and my coworkers couldn't get enough of them!! Caution: The fondant gets stiff, it bent my mixmaster beater (the wiry kind). These are great! The egg wash helps secure the walnuts. Almond in the fondant is wonderful.